If you are looking for mental health help, there are many options available in the community! Scroll below for mental health resources that may come in handy. 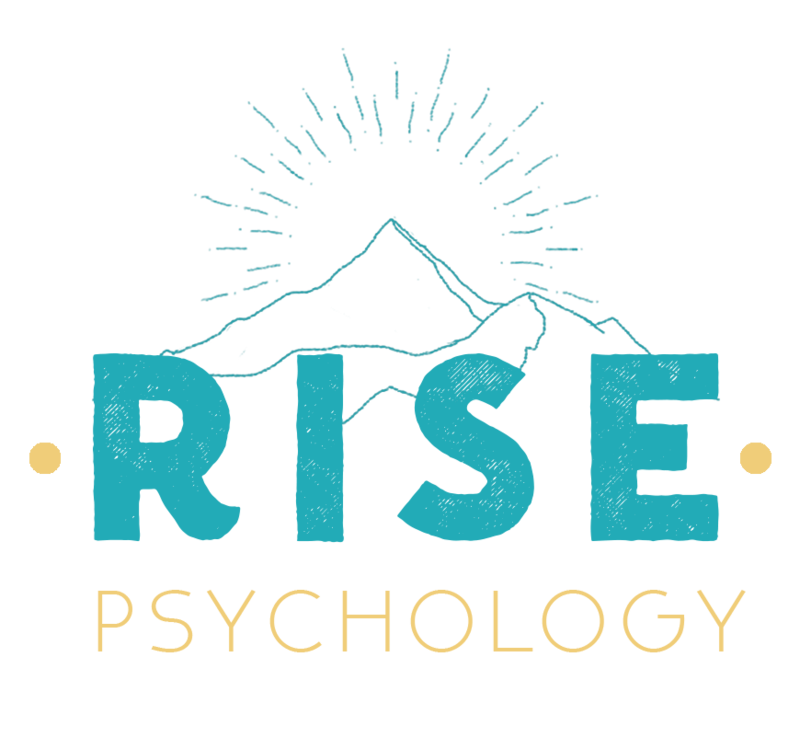 Please note that by using Rise Psychology's website and this resource list, you herein agree to Rise Psychology's website terms. This list of resources is not all-inclusive and not an endorsement of providers and organizations that are listed, and your use of information provided on this list does not constitute a professional relationship with or a referral from Rise Psychology. In addition to this resource list, you may wish to consult other resources including your doctor or other trusted professionals, your state’s psychological or psychiatric association, or local university psychology or psychiatry departments. Always inquire about the credentials of any practitioner before choosing a therapist or psychiatric provider. You can call your insurance for a list of insurance-covered psychotherapists or counselors. You can ask your primary medical care provider for referrals to local counselors and/or psychiatrists (medication treatment providers). You may search specifically for psychologists using www.findapsychologist.org. To find providers who offer psychiatric medication management, you may also call your insurance for information about psychiatry referrals, ask your primary medical care provider for a referral, and/or search www.psychiatrists.psychologytoday.com . If there is a life-threatening emergency, please call 911. For all other mental health crises in Washington, please call the Behavioral Health Organization (BHO) crisis line for your county. Description: This website offers detailed information about OCD and related disorders, and has a resource directory for therapists who work with OCD and related issues. Description: If you are looking for a therapist who works with suicide prevention, HelpPRO connects people experiencing depression, suicidal thoughts, suicide bereavement and many other mental health issues to qualified care. Description: Counseling for Asian American and Pacific Islander (AAPI) community youth and adults, as well as other wellness services, including psychiatry/medication management, acupuncture, and referrals. whether immigrant, refugee or American-born. Description: "Provides comprehensive family counseling services to the entire community for all ages and incomes." Offers individual, couples, family, group therapy; art, play therapy; clinical consultation; assessments. Description: "The Alliance Community Psychotherapy Clinic is a project of the Northwest Alliance for Psychoanalytic Study. The clinic’s primary mission is to make psychoanalytic psychotherapy available to members of our community who would otherwise not be able to afford it." Description: Mental health counseling, multicultural counseling & family counseling. Three established branches in Seattle, Redmond, and Bellevue, with daytime and evening appointments available. Services are covered by most insurance plans. Reduced fees are available at their Neighborhood Centers. These locations also accommodate standard fee/insurance covered clients. Description: Counseling for individuals, couples and families. Description: Consejo Counseling offers comprehensive behavioral health services to the Latino community of Washington, including outpatient mental health for children, youth, and adults, substance abuse disorder programs, domestic violence programs, complementary medicine services, and transitional housing services. Description: Sound Mental Health provides comprehensive services, including mental health, substance abuse and behavioral health services. Description: Samaritan provides spiritually integrative, affordable counseling for individuals, couples and families in 14 locations in Seattle, Shoreline, Bellevue and South King County. In addition to counseling, they offer mediation services, support groups, education and consultation. This includes professional education for working therapists, consultation with clergy and congregations, as well as classes for churches and community organizations. Description: "The therapists of the Psychotherapy Cooperative work individually with adults who experience depression or discouragement, problems with self-esteem or anxiety, difficulty with life transitions and other issues influencing the quality of life." Description: Counseling services specializing in serving gay, lesbian, bisexual and transgender people & counseling for persons with mental illnesses. Description: The Child Anxiety Center is a multidisciplinary specialty center devoted to the treatment of anxious children, adolescents and families. They offer individual therapy for children, teens, provide parent coaching and individual therapy for parents, and prescribe medication when indicated. Description: The Child and Teen Therapy Program at Seattle Psychology includes assessment and school interventions; emotional and behavioral regulation skills training; and individual, parent and family therapies. Locations are in Wallingford and Lower Queen Anne. Description: Seattle Children’s Psychiatry and Behavioral Medicine team specializes in providing short-term, evidence-based care for children and teens. Please reference their website for conditions treated and services offered. Description: Mindful Therapy Group has a number of independent psychologists and therapists that offer treatment for various issues. They have multiple providers that treat children and adolescents, as well as many providers that treat adults. They have locations in North Seattle, Mountlake Terrace, and Southcenter. Description: The Psychotherapy Clinic of University Washington at Harborview has offered DBT programs for over 20 years for those with borderline personality disorder, self-harm or suicidal behavior. Description: DBT programs for adults, adolescents and families struggling with various struggles related to emotion dysregulation, including but not limited to borderline personality disorder. For Help Finding Mental & Physical Health, Transportation, Food, Housing, Etc.